Did you know this about me? Because I really do. Please don't base my love on the inconsistency of how I pronounce them: "Hero" one day and "Jai-ro" the next, I am still a true fan, I promise. I also, apparently, don't even care if you're the food stand right next to Home Depot - if you serve a delicious gyro, I will eat it. After our humid-filled 5K on Sunday, Dan and I wanted to go home, sit on our recliners and get some delivery. We decided on the Santorini Grill because we had recently recieved a delivery menu from them, and 1) I love gyros 2) I am obsessed with Santorini and therefore squealed in excitement that a restaurant close by had Santorini in their name. I ordered the gyro wrap for $5.99 which came with a small side of chips. I personally was happy with the quantity of chips, but that really depends on your tummy's need. 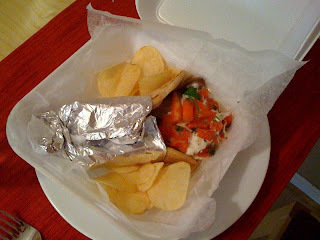 The wrap itself was large, meaty, and had a TON of tzatziki sauce. The sauce was clearly made from whole yogurt, with large chunks of tomatoes and cucumbers. I loved this sauce, and glad that I was given a lot so that I could dip a couple of my chips into it. The gyro meat was nice and thick, and seasoned well. Dan ordered the cheese pizza (12 inch: $7.95) and although he liked it (the tomato sauce definitely has a different taste about it that I really enjoyed and may taste even better with veggies), he said he probably would continue ordering pizza from elsewhere and stick with Greek specialties at Santorini Grill instead. Sounds good with me!